Kua Tacobar used to be La Taqueria: Rotterdams first Taqueria. It was a nice and authentic place which felt a bit like a family run community center. It also served as a Spanish language meet-up location, where Spanish speaking people could mingle with people that were trying to learn Spanish, very sympathetic although I never dared to visit one of these meet-ups. My all-time favourite Mexican food is enchiladas verdes: corn tortillas filled with chicken soaked in a green tomatillo and jalapeño salsa, topped with cream and cheese. 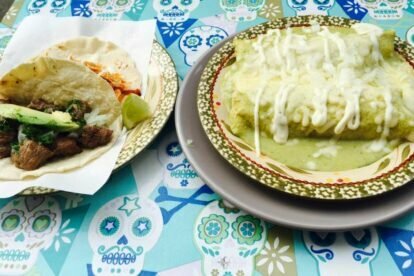 Actually I would eat anything as long as it is smothered with this heavenly creamy green sauce, I’ve been to a lot of Mexican restaurants but i think the green sauce of Kua has been the best so far!